Aims: This study was conducted to assess health-effects of exposure particulate matter (PM 10 ) in Ahvaz city (located in South-Western Iran), during 2009. Materials and Methods: The adverse health effects of PM 10 were calculated by relative risk (RR) and baseline incidence related to health end point PM 10 . A specialized model, the air quality health impact assessment tool (AirQ2.2.3), was used to assess the potential impacts of PM 10 exposure on human health in Ahvaz city during 2009. PM 10 data was taken from Ahvaz Department of Environment. These data were in volumetric base. Health effects are being related to the mass of pollutants inhaled and should convert on the gravimetric basis. Conversion between volumetric and gravimetric units (correction of temperature and pressure), coding, processing (averaging), and filtering are implemented for solving such problem. Results: The results revealed that approximately 3% of total numbers of deaths and respiratory mortality happened when the PM 10 concentration was over 50 μg/m 3 . Sum of total number of deaths attributed to PM 10 was 1165 cases in 2009. Based on the results of this study, 13% of all respiratory mortality were attributed to PM 10 concentration over 20 μg/m 3 in Ahvaz city during 2009. High percentage of the observed health endpoints was associated with a high concentration of measured PM 10 . Conclusion: Year comparison of PM 10 concentration with standard was revealed particle matter concentration in summer and winter season were higher than standard. Although total mean of particle matter was higher than the standard concentration. The higher percentage of deaths perhaps could be the result of higher average PM 10 or because of sustained high concentration days in Ahvaz. Aims: In this study, the characterization of heavy metals (HMs) and polycyclic aromatic hydrocarbons (PAHs) were investigated in three different industrial sewage sludges in industrial parks of Isfahan province, Isfahan, Iran. Materials and Methods: Sludge samples were collected from three dry bed wastewater treatment plants (WWTPs) within the province during of four seasons of 2011-2012. Gas chromatography-mass spectrometry and inductively coupled plasma were used to measure PAHs and HMs contents in sludge. Results: The average concentrations of Cd, Cr, Cu, Mo, Ni, Pb, As, Hg, and Se in sewage sludge were 305.67, 514, 1019, 6.46, 102.33, 1181.33, 277.33, 226.83, and 6.35 mg/kg dry weight (d.w.), respectively. The concentrations of HMs in most of the sludge samples were above the regulatory limits for the sludge class 1 and 2 to be used in agriculture in Iran. The levels of ∑8 PAHs varied from 92.33 μg/ the to 257.87 μg/kg d.w. in the sludge, that lower than the limitation value (6 mg/kg) recommended by the Europe Union and US Environmental Protection Agency for land application. Phenanthrene, pyrene, and fluorene were predominant isomers of PAH in sludge samples. The highest value was found in the Morchekhort WWTP. Conclusion: The concentration and composition of PAHs and HMs in sewage sludge varied and depended mainly on the quantity and type of industrial wastewater accepted by the WWTPs. There is a pyrene in sewage samples that is a carcinogenic. The concentration of HMs in sewage sludge was above of standard levels. Finally, we are not recommended the using of industrial sewage sludge in agriculture because of the high value of HMs was found in samples. Aims: The aim of this study was decolorization of the synthetic aqueous solution of the acid orange 10 (AO10) dye on Ti/SnO 2 -Sb anode using the response surface methodology based on central composite design. Materials and Methods: The Ti/SnO 2 -Sb electrode was prepared using the standard thermal decomposition method and three variables: Current density (CD), pH, and supporting electrolyte concentration were assessed. The dye decoloration was monitored spectrophotometrically by measuring the absorbance of the remaining dye at the maximum absorption wavelength (λ max ) of 475 nm on a ultraviolet-visible spectrophotometer. To measure AO10 mineralization under optimum conditions, chemical oxygen demand (COD) and total organic carbon (TOC) removal also were evaluated. Results: It was found by the model prediction, minimum dye decolorization was 39% (CD = 6 and pH = 7.5) and maximum dye decolorization was 101% (CD = 65 and pH = 2). Thus, the optimum conditions for AO10 decolorization in synthetic dye solution were electrolyte concentration of 75 mM/L, pH of 2, and CD of 65 mA/cm. Under optimum conditions, decolorization of 100 mg/L dye was complete, and 61.3% and 43.9% COD and TOC removal were recorded after 50 min of electrolysis, respectively. Conclusion: High-efficiency electrochemical degradation of AO10 was achieved over Ti/SnO 2 -Sb anode as a model electrode. It was concluded that the most effective factor for AO10 decolorization was CD. The electrochemical degradation using Ti/SnO 2 -Sb electrode is a suitable and an environment-friendly method for the degradation of refractory dyes in aqueous solution. 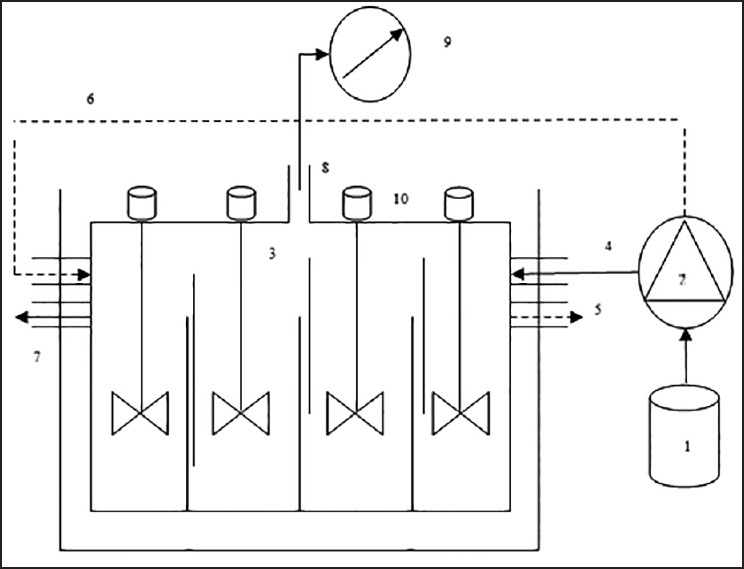 Aims: Feasibility of the anaerobic migrating blanket reactor (AMBR) was investigated for the treatment of composting leachate. Materials and Methods: The AMBR consisted of a rectangular, plexiglas reactor (inside dimensions: length = 43 cm, height = 23.5 cm, width = 10 cm) with an active volume of 10 L. which divided reactor into four identical compartments (2.5 L). Composting leachate was used as a feed. Start-up of a reactor with diluted feed of approximately 10.43 g/L. Chemical oxygen demand (COD) was accomplished in about 44 weeks using seed sludge from the anaerobic digester of municipal wastewater treatment plant and operated continuously at mesophilic phase. The organic loading rates (OLRs) applied to the system was gradually increased from 1 to 19.65 g COD/L.d. Results: The reactor with hydraulic retention time of 10 day at 35΀C and initial OLR of 1 g COD/L.d showed 82.3% COD removal efficiency. The best performance of the reactor was observed with an OLR of 3.79 g COD/L.d. In influent of reactor, BOD 5 /COD ratio, TSS, VSS and TDS were ranged from 0.47 to 0.69, 1650 to 16,830, 990 to 12,622 and 2630 to 31,240 mg/L and in effluent of reactor were reached to 0.28 to 0.38, 660 to 7452, 346.5 to 4597 and 1860 to 19,490 mg/L, respectively. Conclusion: The AMBR could be an appealing option for pretreatment of organic load in composting leachate and improving the efficiency of the next biological reactors. Aims: Modification of multi-walled carbon nanotubes (MWCNTs) via ozone was carried out to enhance removal benzene from aqueous solutions. Materials and Methods: Multi-walled carbon nanotubes purchased from the Iranian Research Institute of the Petroleum Industry was oxidized by ozone generator at %80 intensity for 5 min and in 30% NaOCl. Results: The Fourier transform infrared analysis showed that the peaks corresponded to the hydroxyl and carboxylic acid groups in modified MWCNTs (MMWCNTs) are more intense than that in non-MMWCNTs. 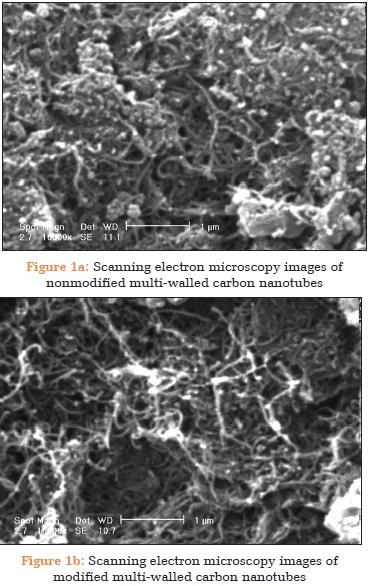 The images of scanning electron microscopy indicated that the MMWCNTs have a lower degree of entanglement with increased porosity compared to the nonmodified one. X-ray diffraction test showed that structural crystallization was increased following the modification. After modification, the efficiency of MWCNTs was increased by 20%. The optimum condition for initial benzene concentration, MWCNT dose, contact time, and pH was: 100 mg/L, 2000 mg/L, 20 min, and 5 respectively. Conclusion: Our research suggested that ozone modification can be a simple method in improvement of the MWCNTs efficiency for removal of benzene from aqueous solution. Aims: This study was conducted to determine the Fenton performance on the fluoride removal efficiency from aqueous solutions. Materials and Methods: The removal efficiency of fluoride from aqueous solutions by the Fenton was carried out by preparation of the water solutions. 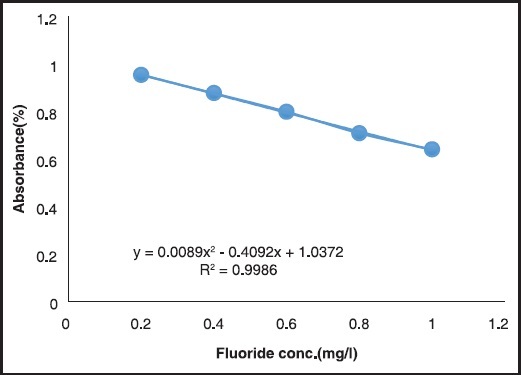 The studied concentrations of fluoride were in the range of 1.5-3.5 mg/L, pH 2-11, contact times 1-17 min, and the Fenton ratios in the range of 1:1-1:10. The SPADNS method was used for fluoride determinations. Results: The optimum obtained values of the studied parameters to maximum 67% removal of the fluoride from the solutions were, the fluoride concentration 2.5 mg/L, pH = 3, Fenton ratio (H 2 O 2 :Fe) = 1:2 and the contact time of 15 min. Conclusion: The proposed material has successfully been applied to the removal of fluoride in different aqueous solutions having a broad concentration range of fluoride. The simplicity of the proposed fluoride removal material, high removal efficiency, a short time and the use of safe chemicals demonstrate the high potential of the proposed method for routine fluoride removal from water samples. The obtained results showed that Fenton process in the removal of fluoride concentration could be an effective method for the removal of fluoride. 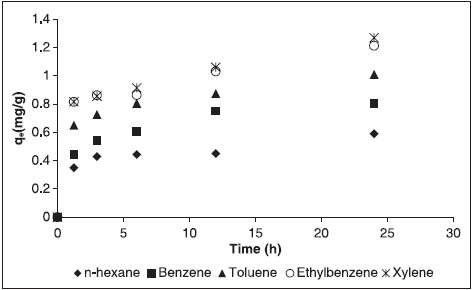 Aims: In this study, the potential capability of compost in the simultaneous adsorption of gas-phase n-hexane and benzene, toluene, ethyl benzene, and xylene (BTEX) was studied. Materials and Methods: Batch adsorption technique was used to assess the adsorption properties of compost. The pseudo-first and pseudo-second order kinetics were considered in order to identify the possible mechanism of the adsorption process. Moreover, the suitability of the adsorbent was evaluated using Langmuir, Freundlich and The Dubinin-Radushkevich isotherm models. Results: After 24 h contact time, the adsorption capacity of one g compost was 1.42 mg n-hexane and BTEX for initial concentration of 7.74 mg/l. The adsorption capacities were in order of n-hexane < benzene < toluene < ethylbenzene < xylene. This order is in accordance to the ascending octanol-air partitioning coefficient (K OA ) order of the compounds (the lowest for n-hexane and the highest for xylene). The kinetics data proved a closer fit to the pseudo-second order model, while the isotherm experimental data were a good correlation to both Freundlich and Langmuir models. Conclusion: The experimental data show that a material with an organic matrix, that is, raw compost, has a higher adsorption capacity for the gaseous compounds with higher K OA . Overall look to the results of this study indicates that although the raw compost could adsorb gaseous n-hexane and BTEX, its capacity may not be sufficient for the continuous removal of VOCs from the air in the compost-based biofilters, in which biodegradation play a key role. Amis: The present study was aimed to compare and evaluate the level of microbial (parasitic and bacterial) quality and physicochemical conditions of the water from five different types of indoor swimming pools (three men's and two women's pools). Materials and Method: This research was a cross-sectional study. Totally, 60 water samples were collected from five public swimming pools in Kermanshah, Iran. Microbial (parasitec and bacterial) and physicochemical conditions were examined according to the standard method. Results: Results indicated that the average of physicochemical parameters, except temperature, in all women's swimming pools was more sufficient than the men's swimming pools; but, there was no significant difference between them (P > 0.05). Conclusion: It can be said that, gender cannot be very effective (especially, in terms of physiological characteristics of skin) in varying physicochemical conditions and biological parameters in swimming pools. The main reason for changing these parameters might be attributed to some factors, such as type and extent of relationship between physicochemical and biological parameters, characteristics and source of water, type of filtration system, pools' operation and maintenance, effective disinfection, personal hygiene, etc. Aims: The aim of this study was to determine the prevalence of parasitic infection via vegetables consumed in Isfahan in 2011. Materials and Methods: In this cross-sectional descriptive study, 120 samples of vegetables were collected from 12 sites in the vegetable supply of Isfahan. Then samples were washed carefully with the detergent, the solution condensed with the Sheeters flotation method and ether Ritchie method in case of detecting parasites with microscope. Statistical analysis was done with Excel and SPSS software. Results: Among the samples, 48.4% were infected with pathogenic and nonpathogenic parasite eggs and larvae, and 51.6% of samples were not infected by parasite. 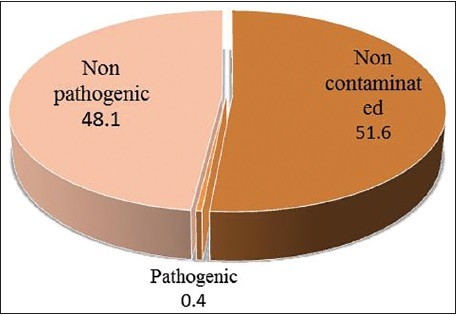 Among the contaminated samples, 48.1% were nonpathogenic, and Giardia with a frequency of 0.4% was the only pathogenic parasite that observed. Conclusion: The study showed that the percentage of parasites in raw vegetables was close to zero. However, the previous study in Isfahan city reported 13% contamination. The reduction in intestinal worm infections is probably the result of development of water and wastewater networks, improvement in public health and public knowledge about parasitic infections and different ways of its prevention. 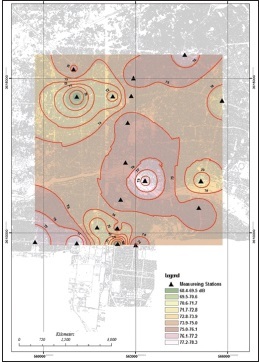 Aims: The aim of this study was to evaluate noise pollution levels (NPLs) in Isfahan, compare with guideline values and providing a zoning map. Materials and Methods: This study was a descriptive cross-sectional type. Totally, 19 stations were selected from most congested areas throughout the city. In determination of these stations, the Isfahan information maps of the city traffic (obtained from Isfahan traffic and transportation organization) were used. Noise parameters L 10 , L 50 , L 90 , L 95 , L 99 , equivalent sound level (L eq ), sound exposure level, sound pressure level, L min , L max , and L peak were measured using a CEL-440 sound level meter for 3 months of winter 2010-2011. The NPL and traffic noise index were calculated by a mathematical formula. All measurements were carried out twice a day (morning [a.m.] and afternoon [p.m.]) with the time interval of 0.5 h. To prepare the zoning map of the measured L eq , ArcGIS software version 9.3 was used. Results: The mean and standard deviation of the measured L eq values in the a.m. and p.m. were 74.6 ΁ 2.78 and 72.6 ΁ 4.43 dB (A) , respectively. In comparison, there was a significant difference between the average L eq values of a.m. and p.m. (P < 0.001) and both were higher than the noise guidelines suggested by Iranian environmental protection organization. The zoning maps show that the maximum L eq in the a.m. (78.3 dB (A) ) was related to Ferdowsi bridge station and in the p.m. (79.6 dB (A) ) was dedicated to Jomhoori square station. Conclusion: It can be concluded that as in the most cases the noise levels of Isfahan exceeded from the guideline values. This city is categorized in the noisy/crowded cities in Iran. Thus, noise pollution of Isfahan can be a serious problem and investigating its reasons is recommended. 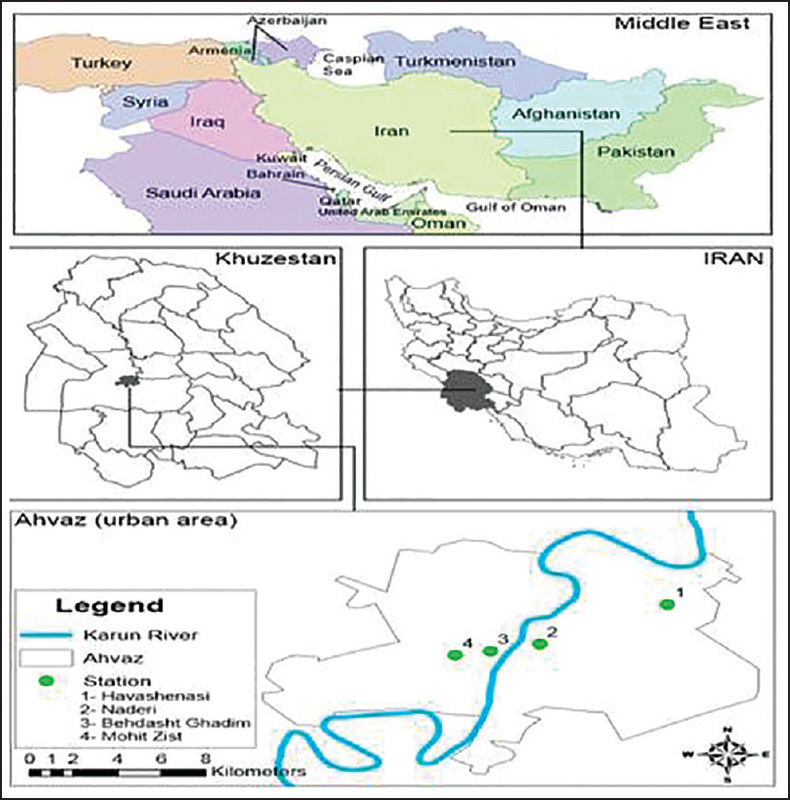 Aims: This study was conducted to investigate the indoor and outdoor air quality at Ashayer Hospital in Khorramabad, Lorestan, Iran, from May-August 2013. Materials and Methods: Air samples were collected using the ZEFON pump (ZEFON factory, USA) based on manufacturer instructions. Bacteria were isolated via differential methods. Diagnosis of fungi was performed based on amount of fungal colonies growth, shapes, colors, pigments, and microscopic procedure. The effects of various environmental factors including temperature, humidity and outdoor bioaerosol levels were also investigated. Results: Staphylococcus spp. were the most predominant isolated bacteria from studied wards. Furthermore, other microorganisms including Streptococcus spp. Corynebacterium spp., and Micrococcus spp. were also isolated from the hospital air. Moreover, the most frequent fungus in indoor environments of hospital was Penicillium spp., while Aspergillusspp. and Alternaria spp. were the next frequent ones. In addition, the most frequent fungi in adjacent outdoors were Penicillium spp., Aspergillus spp., and Cladosporium spp., respectively. No significant difference was found between the mean concentrations of bioaerosols in inside and outside of hospital (P > 0.05). Conclusion: This study suggests that the bioaerosols level in the hospitals were relatively high. Thus, hospitals should enhance practice of good sanitation protocols and infection control measures. Aims: The present study aimed to investigate the relationship between traffic noise and drivers' reaction time (RT) and their error in estimates of movement time. Materials and Methods: In over all, 80 university students with at least 3 years postlicense experience of driving were divided into two groups including traffic noise exposure and control group. S5 test of Vienna test system package was used for assessment of RT. 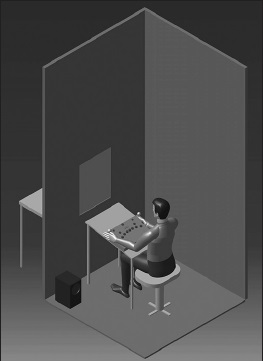 In addition, time-movement anticipation was employed for measuring the rate of error in estimation of movement time before exposing to the traffic noise. After a 1-month interval, participants in the experimental group were exposed to traffic noise about 2 h and the tests were performed again for both groups. Results: Accordingly, RT was statistically higher after traffic noise exposure for male and female. However, there was no significant difference between time of movement before and after exposure to traffic noise both for male and female (P > 0.05). In addition, no difference was shown between movement time, number of accurate estimates, and number of estimates with gross errors before and after of traffic noise exposure in experimental and control group. Conclusion: The results suggest that traffic noise may be associated with poorer mental processing, which can result in longer RT during driving. Therefore, traffic noise would expose drivers to consequent accidents and incidents. Aims: The purpose of this study was to remove azonium compound using the photocatalytic property of nickel (Ni)-doped titanium dioxide (TiO 2 ) nanoparticles coated on Iranian natural zeolite. Materials and Methods: Nickel-doped TiO 2 nanoparticles with the molar ratios of 0, 0.17, 2, 9% Ni/TiO 2 were prepared via the sol-gel process and coated on Iranian natural zeolite clinoptilolite (CLI). Afterward, X-ray diffraction, scanning electron microscopy and inductively coupled plasma studies were conducted to describe Ni and titanium. Photocatalytic removal of azo dye in concentrations of 25 and 50 mg/L was performed by fixing the composite under ultraviolet irradiation. Results: TiO 2 nanoparticles in both the anatase and rutile phases were obtained via the sol-gel method with the ratios of 86.33%, (34.44 nm particle size) and 13.67% (18 nm particle size) and were then coated on Iranian natural CLI zeolite. The results indicated that the photocatalytic removal efficiency of the 9% Ni/TiO 2 -CLI samples, in which the azo dye concentrations were 25 and 50 mg/L, was 93% and 79% at 160 min. In addition, the composition of the 9% Ni/TiO 2 -CLI possessed the greatest removal rate difference of azo dye at the concentrations of 25 and 50 mg/L. Conclusion: Application of Iranian CLI as a substrate is the most cost-effective way to increase the photocatalytic activity. Furthermore, adding Ni to TiO 2 can increase the photocatalyst removal efficiency of azonium compound.